Goh Chok Tong: "The question of gay rights is an example. We have told them it’s an offence because it’s in the criminal code and the Muslims too will be against gays. ... the population will understand that some people (gays) are born that way. We are born this way and they are born that way but they are like you and me." Singapore's first Prime Minister, the late Mr Lee Kuan Yew, said he believed homosexuality is in a person's genes. Kuan Yew also does not mind if anyone of his grandchildren is gay. Lee Kuan Yew: "Some people are that way and just leave them be.....It's already accepted in China. It's a matter of time before it's accepted here. "....That's life. They're born with that genetic code, that's that. Now our PMs have said gay is congenital. But 10 Muslims nations want gay to die for their "genetic code". It’s their law. 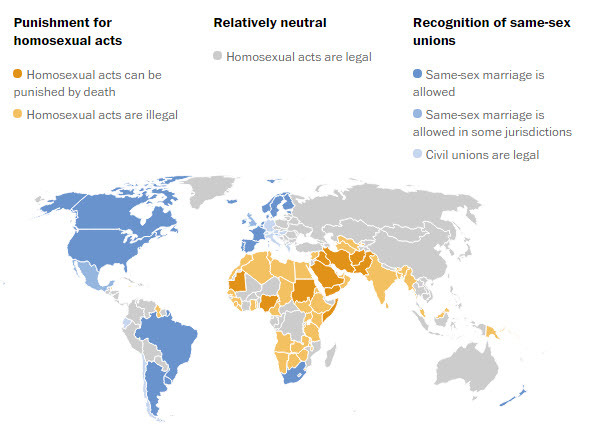 Almost every single Islamic nation criminalized gay. And even PM Goh Chok Tong said Muslims are against gay. Singapore Home Affairs Minister K Shanmugam said on Tuesday (2016, Jun 14 ) that the apparent targeting of the gay community in a shooting in Orlando, Florida on Sunday was "unacceptable". He failed to mention the Muslim state terror against gay community, is far worse than terrorists' work. So is Islam the most peaceful religion as forever ranted by our establishment, or Islam is a religion of hate and murder? The answer cannot be both. Or alternatively does gay deserve to be murdered? No one can give the true answer without repercussion. Anyone who honestly infer about gay and Islam will be deemed fanning hatred. Should we continue to ostrich ourselves and strive to be "sensitive" and "tolerance", or should we have the courage to tell the truth? The only certainties are cowardice, falsehood and schizophrenia are being interpreted as virtue, tolerance and sensitive to others. I highly respect Islam because they do not go along with the whole progressive agenda. Current western values is just protestantism without God and changes according to what the elites believe in.